Got up today and went over to Ft. Wayne, IN. 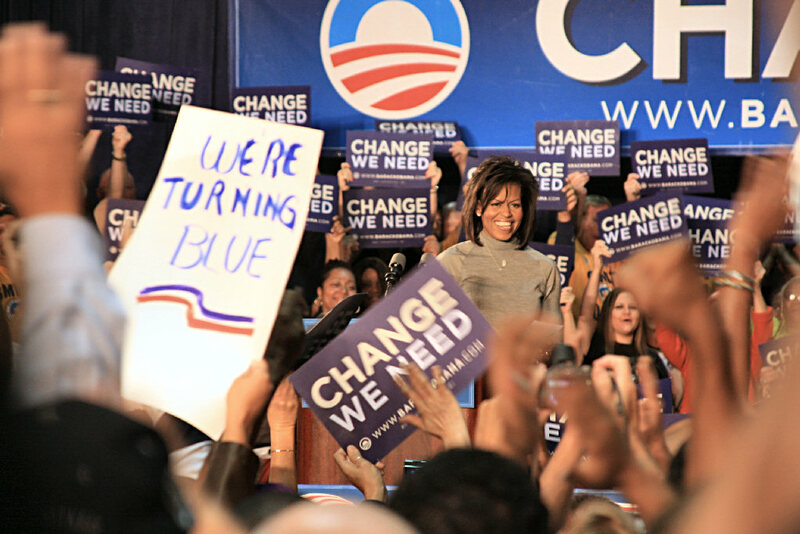 Michelle Obama was speaking there, in a campaign rally for her husband. It was originally supposed to be in a pavilion in a park in Ft. Wayne, but it was moved to the Grand Wayne Center Monday. Either someone looked at the weather forecast for today, or there were security concerns. I would bet on the weather. I had to park a few blocks off, since the closer parking lots were full. Can’t imagine why that happened. There were hucksters on the sidewalk outside the convention center. They were selling everything from Michelle Obama T-shirts to Obama/Biden buttons. There were also some protesters on the sidewalk, with signs against abortion. They were quiet and polite, unlike the idiot that stuck his head out of his car yelling Obama bin Laden. Things were well organized inside, although I got there early, so they were hardly overwhelmed. I don’t know if there was ever a time it would have overwhelmed them, it was not a huge crowd, although it was respectable. Linda Pence was the opener, she is the Democratic candidate for State Attorney General in Indiana. She talked about being inspired by Obama to run for office for the first time. She was followed by local organizer who encouraged everyone there to go directly to the local court house and vote early. I am sure that the workers there would have really appreciated a few hundred people showing up all at once to vote. A few minutes later, after an invocation, Birch Bayh came out. He was very popular with the crowd there, not surprising given his and his family’s history in the state. He said that as soon as he met Michelle, he knew that he and Barack had something in common. They had both married above themselves. 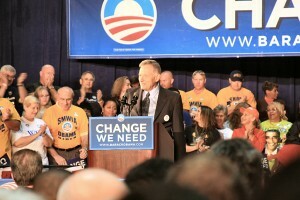 He was very passionate speaking about the election and getting Obama elected. There was also a speaker that told about her niece and the way the current health care system didn’t cover her, or find the cancer that is killing her. The she talked about the children that came into the library where she worked that couldn’t go to the doctor, because their family could not afford more than one at a time at the doctor. 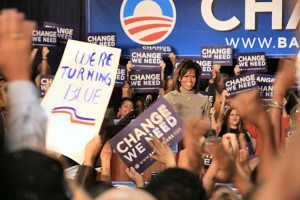 Michelle Obama, surrounded by signs. out and they were very loud and enthusiastic. She was also enthusiastic, and seemed to like being there. She seemed to be a little shaky starting off. but quickly warmed up and talked to the crowd. Not as well as Barack, but still very good. She talked about where she and Barack came from, him a single parent family and her a blue collar family from the South side of Chicago. She talked about how he understands what it is like to watch his mother try and keep things going at home while working and going to school. About seeing his mother die from ovarian cancer at 53, trying to figure out how to pay for treatments that the insurance wouldn’t cover because they said that cancer was pre-existing. She really did a good job getting across the idea that Barack understands what it is like to actually live in this country. 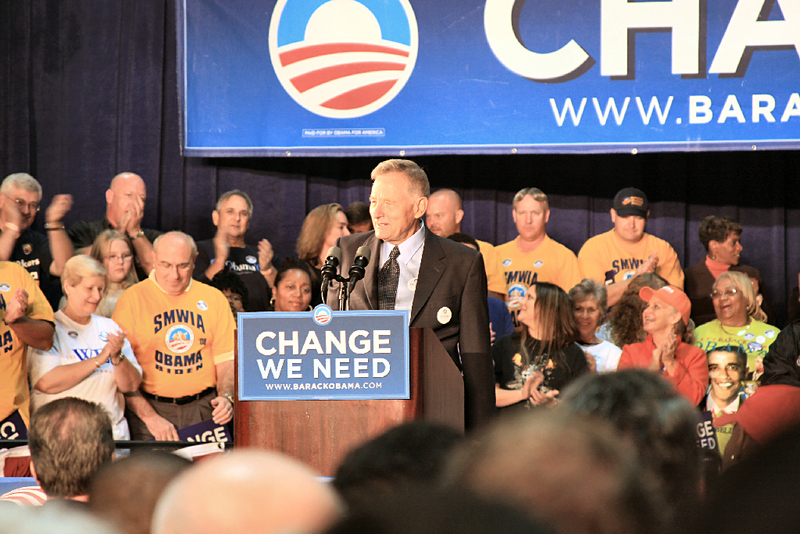 It was the first political rally I have been to. I hope to get to one with the actual candidates before the election. After that, it was home to do some reading, until now. I have been watching the debate on CNN. It is not very exciting, but I didn’t expect it to be. Obama has been very even tempered and calm, not getting upset or excited. McCain has also been doing better in this debate than the first couple. He has actually looked at and talked to Obama, and been much more focused. But he has not been outstanding, which he really needed to do to improve his polling numbers. McCain did bring up Ayers, as he said he would. And Obama gave the same answers he has been giving since Clinton brought up Ayers during the primaries. But of course, that will not really answer anyone that still has questions. After all, if they did not believe it the last few hundred times it was brought up, why should they believe it now. It will be interesting to see how the numbers go after tonight.